Come out and join us for a workshop on Mental Health Literacy. 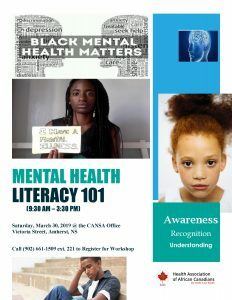 It will take place Saturday March 30, 2019 @ the CANSA Office, Victoria Street, Amherst, NS. If you are interested in attending, please call (902) 661-1509 ext. 221 to register for the workshop.